Christmas is edging closer and it’s a busy time at Pollok FC, on and off the pitch. Next weekend (16/12) we welcome Kilwinning Rangers to Newlandsfield for what promises to be a close fought encounter. This will be our last home game of the year and forms part of a weekend of much activity at Newlandsfield. oving popular and the remaining copies will be on sale along with other club merchandise including hats, scarves, mugs and the much coveted Pollok club tie. In the event of a weather related postponement, the pavilion will be open on Saturday between 12:30 and 4:30pm. And then on Sunday 17th December the pavilion will be open between 12pm and 5pm for the annual Pollok Christmas Prize Draw (Draw takes place at 2pm). 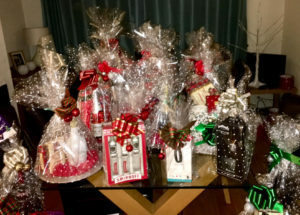 This event is a popular date in the club calendar and among the many prizes on offer this year are a Fitbit, a £50 Majestic wines voucher and the top prize of £250. The draw will be in safe hands with Jordan Longmuir as our special guest for the day. Club merchandise will also be available for purchase. 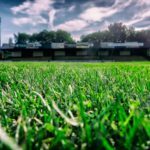 Finally, with a brief look ahead to 2018, the club will introduce what we hope becomes an annual fixture in the off the field calendar. 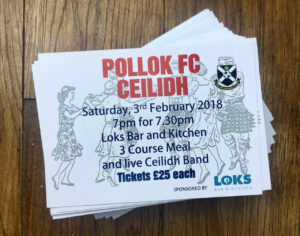 On Feb 3rd 2018 we will hold the Pollok Football Club Ceilidh in the function suite at Loks. Tickets cost £25 and include a 3 course meal and live Ceilidh band. You can grab your tickets early for this next weekend either in Loks on Saturday or at the Christmas Draw on Sunday. We’d like to take this opportunity to wish you a Merry Christmas and a Happy New Year. Limited tickets still remain for what promises to be an entertaining night this Friday at the annual Pollok sporting dinner. Compered by Bill Copeland, the club look forward to welcoming this years speakers, former referee Kenny Clark and Everton, Leeds and Nottingham Forest legend, Duncan McKenzie. The dinner is one of the clubs biggest fundraising events of the year and an important part of the club calendar. Once again Lok’s Bar and Kitchen will provide the hospitality and the bar will be stocked with whiskies, spirits and an extensive craft beer selection. Doors open at 7pm with the proceedings kicking off around 7:30pm. Tickets are on sale now costing £35 a head. Individual tickets can be bought from Loks Bar and Kitchen, by dropping an email to info@pollokfc.com or by sending a message through our social media channels. Married to Marilyn from Larkhall. It’s a mixed marriage, she’s a human being and he’s a lawyer and dotes on his daughter 12½ (it’s a daft name but Marilyn chose it). Hobbies? Plays a mean game of golf – won’t pay the green fees. Bill’s ambition as a speaker is to follow his grandfather’s advice “Always leave them begging for more.” Which was the very attitude that led to granddad being struck off as the world’s worst anaesthetist. Born in Govan, a quaint fishing village on the banks of the Clyde, home to Sir Alex Ferguson and Billy Connolly, he attended a tough school. Tough? There was a boy in the class who was allergic to peanuts and they used to take him round the back of the bike shed and make him play Russian roulette with a packet of Revels. Bill then attended Allan Glen’s School, which was selective, not doing too well as he selected to go only on Fridays. He left with 6 A Levels but was caught at the gate and made to return them to the Headmaster. Bill studied at Strathclyde University, graduating B.A., LL.B., which his criminal clients think stands for “buy us a lager and a large Bacardi”. Bill is without doubt a very accomplished after dinner speaker, and an evening with him is one not to be missed! Kenny Clark: Kenny made his name refereeing in the Scottish Premier League. He also refereed at international level for FIFA. Over an 8-year period from 2000, he covered no less than 6 Scottish Cup finals. Kenny continues to work as a solicitor based in Glasgow with occasional appearances on BBC Scotland’s “Sportsound” programme. He is also an accomplished after dinner speaker and his memories of his time as a top-class referee are guaranteed to have us enthralled. Duncan McKenzie: Was one of the most talented footballers of his generation, playing over three hundred games and scoring well over one hundred goals. He became a legend at Everton, Leeds United and Nottingham Forest and is now a legend on the after dinner speaking circuit. Some people will still remember Duncan jumping over mini cars as pre match entertainment – something you wouldn’t see David Beckham doing today. Duncan has written for national newspapers and magazines but now concentrates on radio commentating and after dinner speaking. He is considered, by his peers, to be one of funniest after dinner speakers on the circuit. The Pollok Sporting Dinner is the biggest fundraising event that the Club organises and therefore is an important part of our calendar. Those of you who have attended in the past will know that as well as raising important funds for the club it is always a great night. This years event takes place on Friday 10th November in Lok’s Bar & Kitchen and Bill Copeland will once again chair the night. Bill is one of the funniest speakers on the circuit and a Pollok supporter to boot. He will introduce one of Scotland’s best ex-referees Kenny Clark, and Everton, Leeds United and Nottingham Forest legend (and another of the best after dinner speakers on the circuit) Duncan McKenzie. Join special guests Rab Sneddon and Harry Erwin, backroom staff and supporters for what guarantees to be the most entertaining evening of the year. Doors will open at 7:00pm with proceedings kicking off at 7:30pm. Loks Bar and Kitchen will once again cater for us and the Bar will be stocked with a great range of malt whiskies, craft beers, lagers and spirits. An extensive wine menu is also available. Tickets are on sale now costing £35 a head. 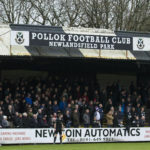 Individual tickets can be bought from Loks Bar and Kitchen, from the organising committee on matchday, by dropping an email to info@pollokfc.com or by sending a message through our social media channels.